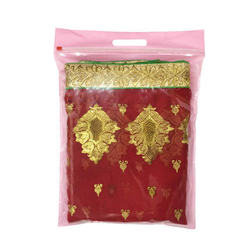 Keeping in the mind the different needs of our valued clients, we are actively committed towards offering premium quality Non Woven Chain Bag. We are devoted towards manufacturing the qualitative range of Non Woven Zipper Bag. Size-16x1480GsmColour-Yellow Rate:7.00 Rs. Indian money per pcsFor use saree and suit packing bags. Bag Size (Inches): As per customer requirement.